"mantab dah bekasigame pengiriman crystal case sudah sampek dan sudah saya terima dengan selamat^^tingkat kan pelayanan biar lebih mantab...tepat 3 hari"
Simple. Intuitive. Easy to use. Connect the Wii MotionPlus accessory to your Wii Remote controller to increase accuracy and enhance play control on compatible games. Look on the back of Wii Game Disc packaging to see which games are specially designed for use with Wii MotionPlus. Wii MotionPlus contains additional sensors that make the Wii Remote respond to the slightest movement, motion, or twist of the wrist. 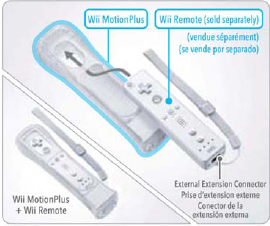 Wii MotionPlus must be used with a Wii Remote, which is sold separately. The world’s top tennis stars are hitting the courts again this May in SEGA’s Virtua Tennis 2009 for Wii. Now every swing is more precise and the action is more intense, thanks to the Wii MotionPlus. Other updates include brand new courts, a new roll call of tennis stars to compete against and even more court mini-games. From EA Sports, experience a near perfect 1:1 swing with the Tiger Woods PGA TOUR 10 bundle, featuring Wii MotionPlus. Elevate your game with an enhanced, true-to-life golf swing that features precise draw-fade capabilities and authentic sports motion. Can’t get enough tennis? Excitement is in full swing with Grand Slam Tennis from EA Sports. Compatibility with the Wii MotionPlus accessory makes it possible to spin your racket and control your in-game player with superior responsiveness and control. Just as with Wii Sports, people will love competing against friends and family. As the competition heats up, Wii Sports Resort is as much fun to watch as it is to play. First-time players will find it easy to pick up a Wii Remote and jump into the action. A wide range of activities will keep players coming back for one more round. Some sample activities include Sword Play, Power Cruising (racing a personal watercraft ) and Disc Dog, which involves accurately tossing a disc to a cute, Mii-like dog.